Home / BLF Live / BLF 2015 Reports / BLF 2015 Reports Day 2 / Are we speaking the same language? 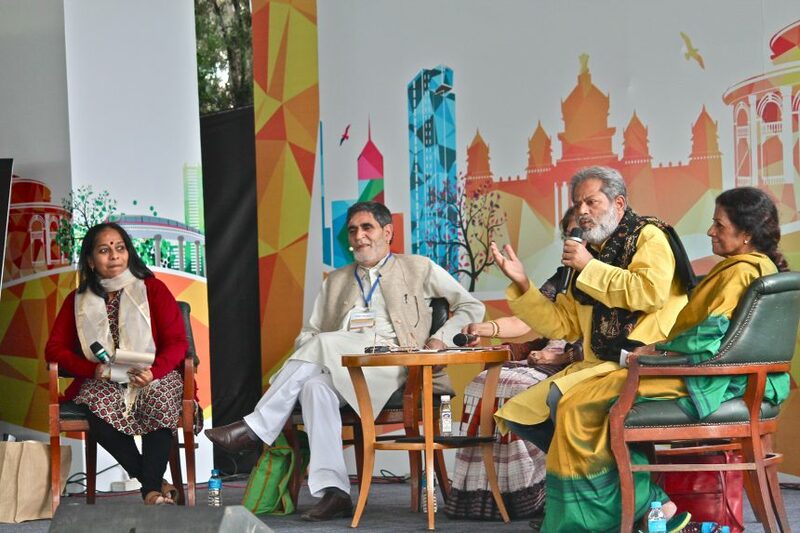 Mridula Garg started her answer by emphasizing on the fact that the entire stock of Hindi books got sold out on the very first day of BLF 2015 which is a she saw as a very good sign. “Metaphorically, all four of us are speaking the same language in terms of context, sensibility, concerns etc.”, said Garg. While talking about the brunt of English being used as the medium for communication on the given dais, she considered it as a matter of both tragedy and convenience. While the reason for calling it convenient was obvious, she mentioned that there is an imbalance in the amount of translations which happen between the literary pieces written in English and non-English language with former being translated more. Hence, the affinity among languages is reduced. Mohammad Zaman Azurdah entered the debate by saying that almost all Indians are at least bilingual, speaking one language which we have learnt and the other which we have lived. “When we express ourselves in a language which we have learned, you cannot do justice to it unless you’ve lived that language”, said Azurdah who found the topic very allusive. He also pointed out that the there is a difference between literature and communication. Having agreed to the fact that some amount of proficiency in English is required in today’s professional world, he said the language which we have lived is like our mother. Even if it has a few shortcomings, we cannot stop living it because it is our own. Differing to this, Mridula Garg stated that there are no shortcomings in our respective languages. Vaasanthi drew focus towards the political connotations of the topic in question. There was a time when a writer writing in a regional language could become a national icon (such as Tagore). But, since Independence (when India got politically liberalised), we have become more heterogeneous now, to an extent that we do not find any nationally recognised regional writer. “Ironically, we have become more Anglo-centric after independence. If you overstress unity, saying that there has to be only one language, then it becomes a political debate.” said Vaasanthi. Subodh Sarkar raised his concerns about how so many languages including his mother tongue (Bengali) said, “India is destroying India. We are all speaking Indian English which is the youngest language and it is a terrible paradox. A death sentence has been drafted against Bengali and various other languages.” On the topic of English being the medium of communication for discussion in the ongoing debate, Sarkar said that language is not a matter of concern when it comes to festivals; it is about the language that your children choose to speak. He expressed his sadness towards his own son getting alienated from his mothertongue. The session got over with Sarkar reciting his poem ‘Mothers of Manipur’.